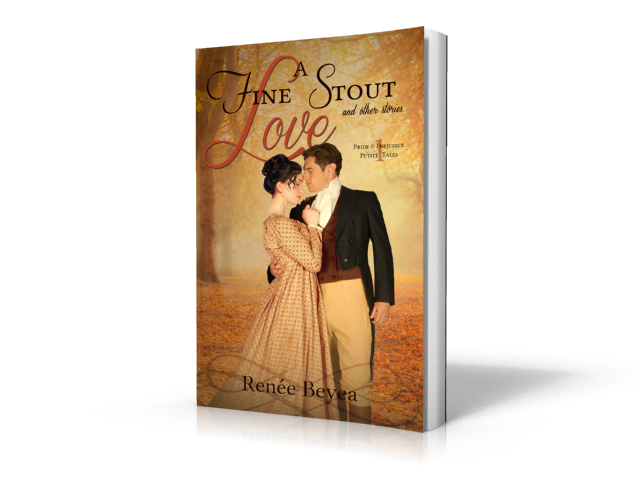 I’m very pleased to receive Renée Beyea in From Pemberley to Milton today to open the blog tour for A Fine Stout Love and Other Stories! Thank you so much, Rita, for hosting me at From Pemberley to Milton and launching the first day of the blog tour for A Fine Stout Love and Other Stories! Each excerpt stop on the tour features an excerpt from a different story. Today’s comes from the title story, though it actually falls second in the collection. “A Fine Stout Love or The Efficacy of Poetry” gives the account of a wayward love poem told first from Elizabeth’s and then from Darcy’s point of view. Enjoy! Lydia rocked from foot to foot, the offending paper fluttering like a flag atop a ship’s mast. The words were only idle imaginings but intended solely for Elizabeth’s personal diversion. She must conceal them. The younger girl shrugged her shoulders. Elizabeth folded her arms, held her sister’s eyes, and refused even a peek at her hostage verses. She was not a Bennet for nothing. She could outlast Lydia for sheer stubbornness. A gust assaulted them, and Lydia whooped with glee. Elizabeth swiped away the tendrils slapping her face and saw the paper consigned to the blast just as her sister pirouetted from reach. The little chit. She would race to the house in feigned innocence, and Mamma would grant her immunity. This was how it had transpired ever since she was a tiny dimpled thing hiding in her mother’s skirts. The white square tumbled end over end, floating, sinking, and diving like a gull on a coastal draught. Elizabeth raced down the drive, her eyes affixed to the sheet as if she could leash it with a look, but it soared too swift and too high. If only Mamma had not insisted they wait for Mr. Collins to walk into Meryton, then this trouble might have been avoided! A massive, black charger paraded into view, her paper careening toward its head. The horse scrambled sideways in a flurry of dust and hooves. The rider sprang from the saddle. He seized her paper with one hand and the reins with the other. Her heart froze. Mr. Darcy. Elizabeth would have fled if she could have commanded her feet to move, but dread turned every reflex, every nerve, every muscle to stone. Bingley nodded and urged his horse forward, examining Elizabeth with drawn brows as he approached. “Good day, Miss Bennet.” He tipped his hat. Elizabeth glanced over her shoulder at his retreating form. Did she curtsey and greet him? She could not recall, riveted as she was by her poem in Darcy’s hands. Apprehension quavered in her stomach. This was infinitely worse than explaining herself to her father. What had she been thinking to frame such fancies in ink? There were not many lines that Darcy should linger long, yet he did. Elizabeth’s fingers bunched and twisted her skirts. If only she could simply disappear! Darcy’s horse prodded him, the breeze stirring his black mane. His master rubbed the solid neck, crooning inarticulate sounds from deep in his throat. When Darcy finally raised his head and peered toward Longbourn, Elizabeth strained to read his expression. Not bemused or scornful or angry, but pensive. He seemed lost in introspection, his stare unseeing. Her laughter bubbled inaudibly. To craft such verses and have him appear only thoughtful? What did she expect? He may have been the object, but not once did she conceive him as the reader. Then his gaze retracted and snagged on her like fleece on a nail. Please note that there is a small issue with the FB link inside Rafflecopter that leads to an error page, so to enter the FB link, please use the links mentioned on the author contacts in this post. Glad to hear you enjoyed it so much, Denise! It’s great to meet an author who’s new to me. The excerpt was lovely and left me definitely wanting to find out what Darcy’s reaction is going to be. I also very much NEED to know what it was that Elizabeth has written! I love your blustery day storyline idea. I really want to read the book now. Just to let you know that the liking on facebook and signing up for your newsletter options at rafflecopter did not work for me. I got a server not found message each time I tried. Just an update to the rafflecopter problem. I used the links in the article to get to the two sites I needed. I am not sure if mail chimp is working now as I did not get the verification email. I am sure you can get it to go though! Thanks for the info Kneyda, I tried the link and it works but I’ll check if there is any issue with the signing ups. Thank you for letting us know, and we’ll try to solve it asap. Thanks for signing up, kneyda–hope you enjoy the Elizabeth & Darcy short story subscriber download as well. Good luck with the giveaway! And thank you to Rita and Jakki for sorting out the Rafflecopter issues so promptly! Wow! Looks like an engaging group of stories. I agree with Anji…just what did Lizzy write? Ah, the joy of excerpts–you’ll have to read to find out, LOL 🙂 Thanks for commenting, Maureen! I saw a wonderful review on this book on Goodreads by Debbie and I immediately put it on my wishlist. I loved the excerpt and can’t wait to read what it says! This was a cute collection. I enjoyed it. Thank you, Sophia, for the lovely review! I’m so pleased that you enjoyed it. Wow, that sounds delightfully entertaining! Yes, many thanks to Rita for her gracious hospitality and to her equally gracious readers too! This sounds fab! A collection of witty stories based on our beloved couple. Would love to know Elizabeth’s musings!!! oh! To be a fly on the wall as she penned her thoughts!!!! Guess I’ve just got to read the book! Many thanks for the opportunity to win a copy. In that case, I think you’ll get a chuckle from a couple upcoming excerpts. Hope you’ll be able to stop by! Best of luck on the giveaway! That was tantalizing! I already had this book on wish list, but I’m glad to see what’s inside. Sounds lovely, as I just love P&P! Thanks for sharing that Renee. OMGoodness! I agree with Anji! I NEED to know what Elizabeth has written! Wonderful excerpt! Oh, how many times have I wanted to not only shake Lydia but also slap her face. And how embarrassing for Elizabeth. Sounds delightful. I will put this on the high pile of TBR books. Thanks for sharing. Yay–glad FSL made your TBR! Isn’t it funny how much we enjoy squirming along with characters in their embarrassment? Now that I read the excerpt, I want to read it. I love short stories involving P&P, especially when time is limited and you need a quick fix! Love meeting all this new authors to me. And I love meeting readers. So appreciate the warm and encouraging reception! Thanks for sharing with us the excerpt! !